NEW! We are excited to introduce a new recipe highly requested by our customers. 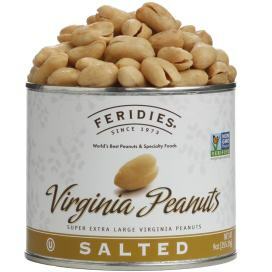 These super extra large Virginia peanuts have been seasoned with the perfect blend of sea salt and ground black pepper. If you have never had Virginia-type peanuts before, you'll be amazed at their large size, crunchy texture and delicious flavor. The dimension of each 9 oz. can is 4" x 3.25". Shelf-Life is approximately 1 year. OU Kosher Certified.